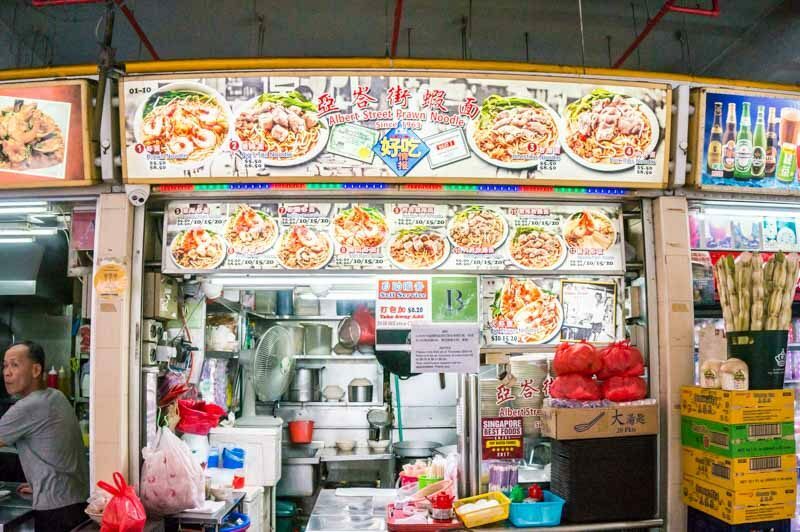 It’s a no-brainer that Old Airport Road Food Centre houses an army of hawkers who have been conquering our hearts and stomachs with mouthwatering dishes since 1973. 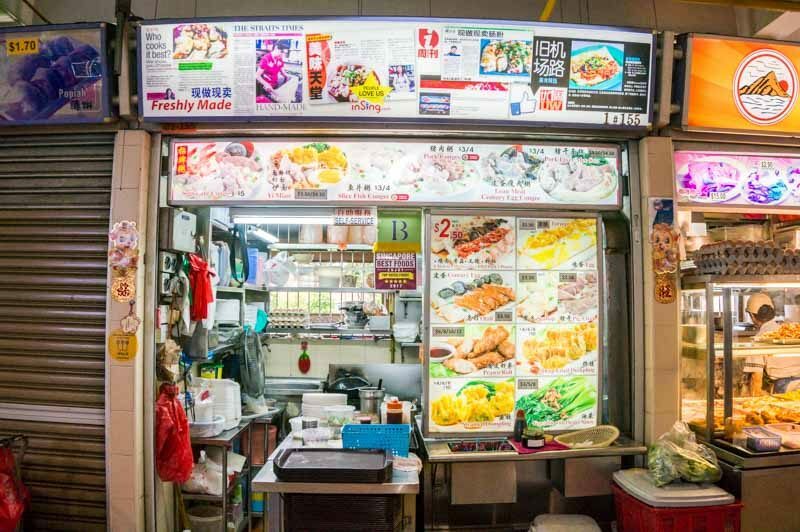 The beloved food centre boasts a wide variety of stalls and is the place to head to for good local cuisine, making it one of the busiest spots during lunch and dinner hours. While we can’t help you with choping parking spots and seats with packets of tissue, we’ve come up with a guide of go-to favourites that will help you decide what to eat amidst all the amazing food. 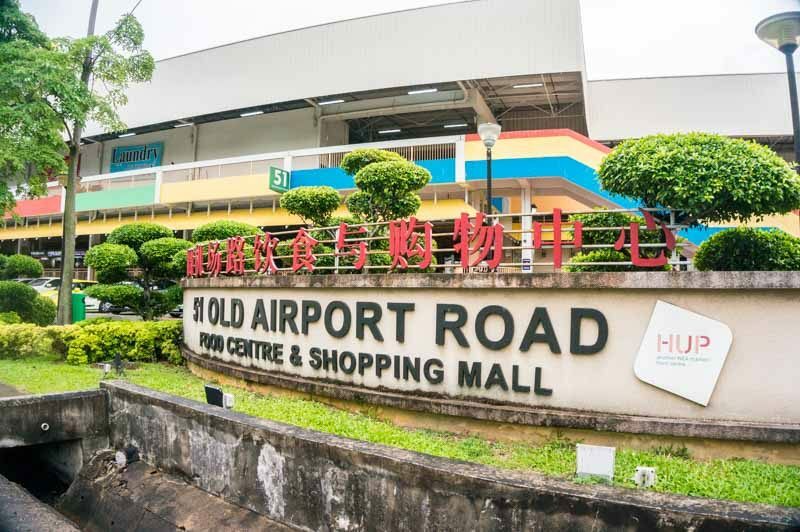 In our opinion, Old Airport Road food centre is probably the best hawker centre in Singapore – here are our recommended best stalls at Old Airport Road Food Centre. 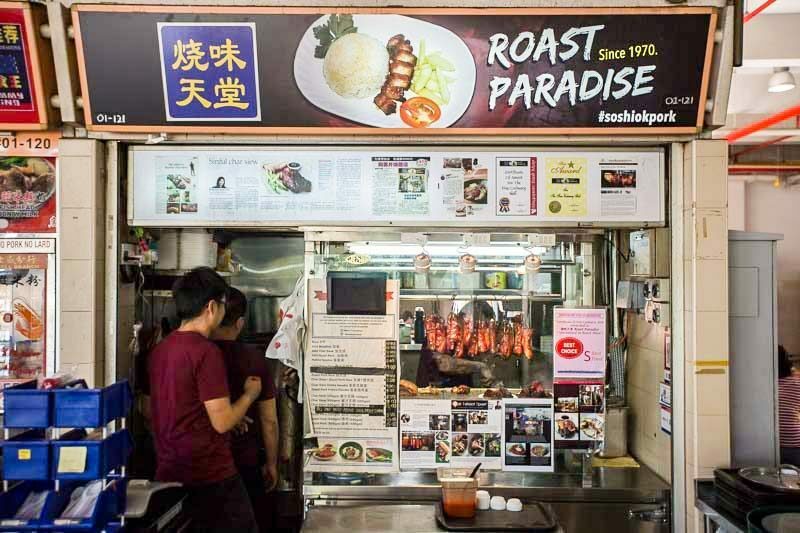 If you’re craving char siew, you definitely need to stop by Roast Paradise. Despite only joining the hawker community pretty recently in August 2016, the stall has already garnered quite the following. Roast Paradise takes immense pride in their roasted gourmet pork which is cooked in a drum under charcoal for three hours, then basted with sweet sauce for a shimmery layer of caramelisation. 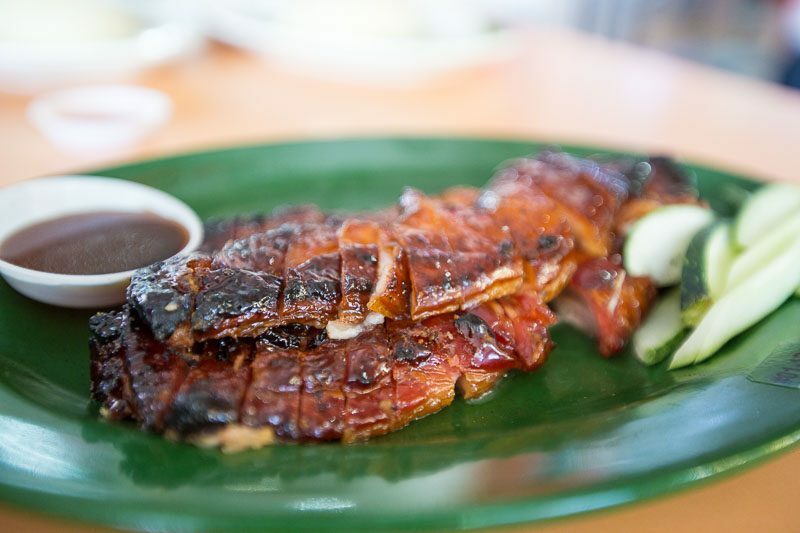 It’s no easy feat to maintain such high standards, but the 300g Char Siew (S$15), which features a leaner cut of pork, will definitely meet all the criteria of roasted meat lovers. As the pork strips undergo a meticulous three-hour process of roasting, the juicy meat was infused with a burst of flavours even without the layers of fat. The caramelised skin had a prominent smoky aroma, and crackled in my mouth. Spot a long queue in a hawker centre? We Singaporeans love to join the crowd anyway (even if we don’t know what kind of food it is) because we know it’s going to be good. 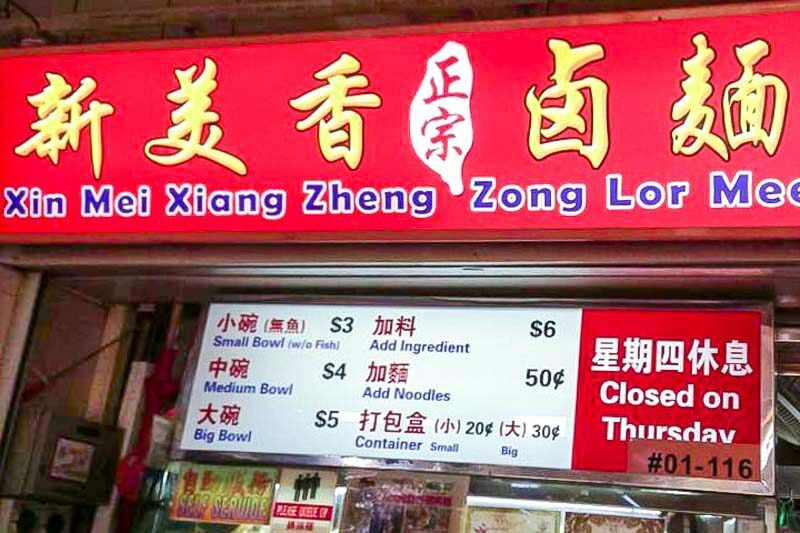 Xin Mei Xiang Zheng Zong Lor Mee (新美香正宗卤面) is one of those stalls, and they sell out super fast. 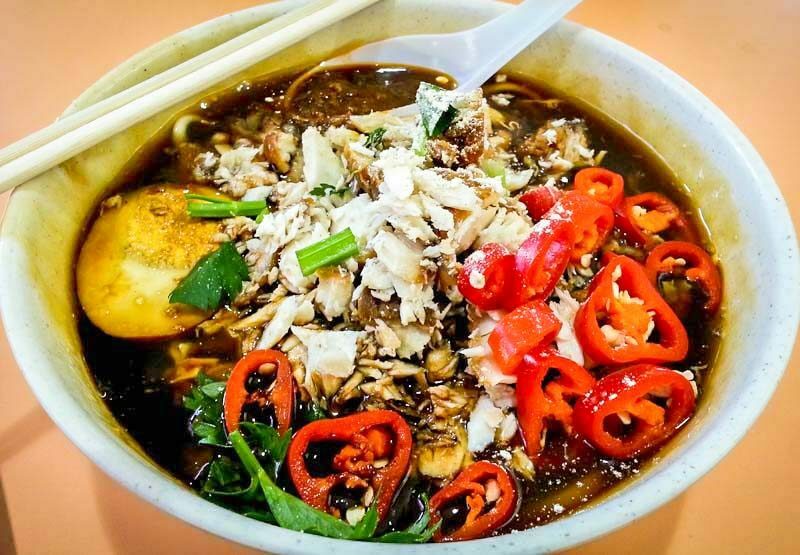 The noodles in the bowl of Lor Mee (S$3 for small, S$4 for medium, S$5 for big) are smothered in thick, goopy gravy infused with five spices and herbs, then topped with shreds of fresh fish. 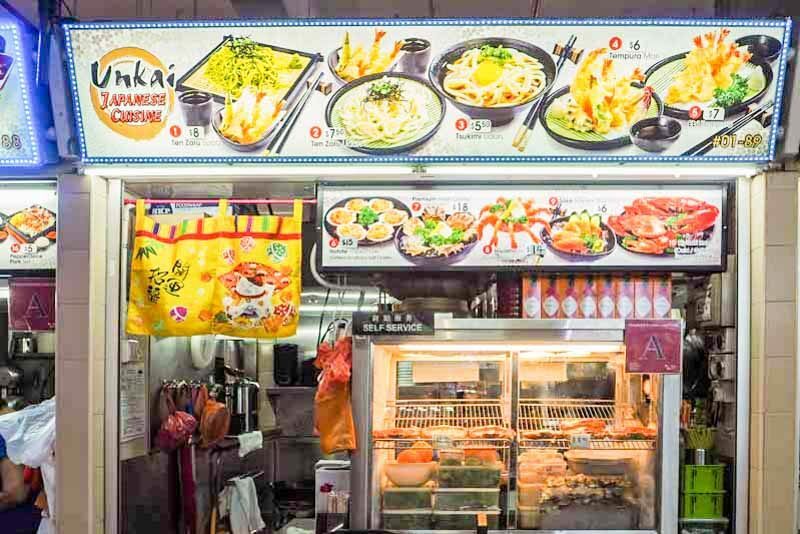 This one is worth the long queue at Old Airport Road Food Centre – but get there early! 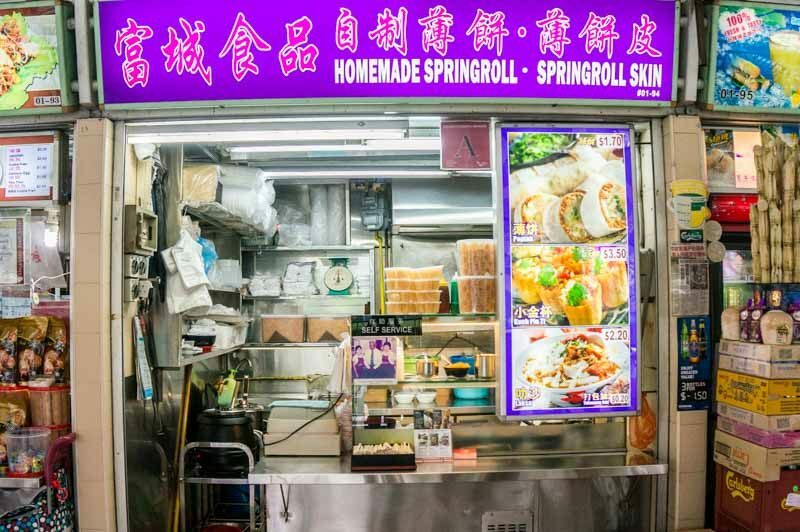 On days when you feel like having something lighter than a bowl of noodles or rice, Old Airport Road’s Homemade Springroll • Springroll Skin rolls up some simple yet delectable popiah for you to get your snack on. 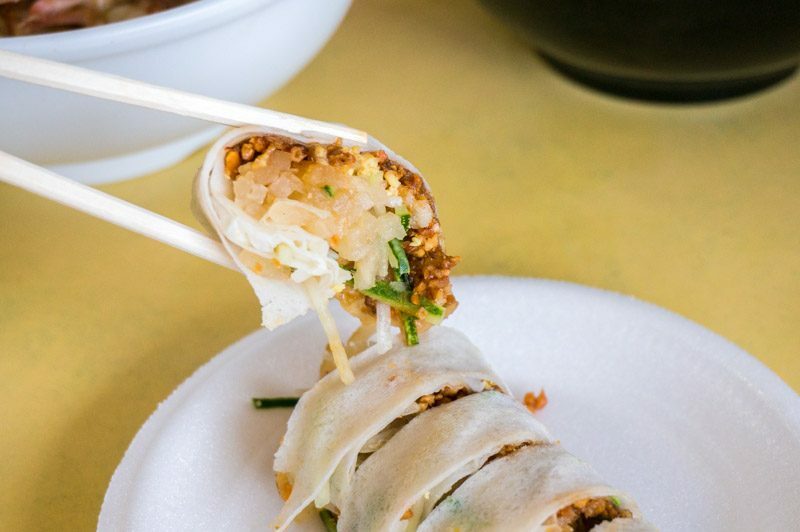 Wrapped in a thin, transparent layer of popiah skin, strips of cucumber, jicama and other veggies are layered with chopped peanut powder and stuffed in the Popiah (S$1.70). On the plate, the roll looked rather small but the filling was so fresh and crunchy with the sweet nutty sauce of peanuts that it was pleasantly light and somehow still satisfying. You can always just order another one anyway, right? Curry puffs can sometimes be too jelak with an overpowering curry paste or dense due to a tough and thick pastry shell. 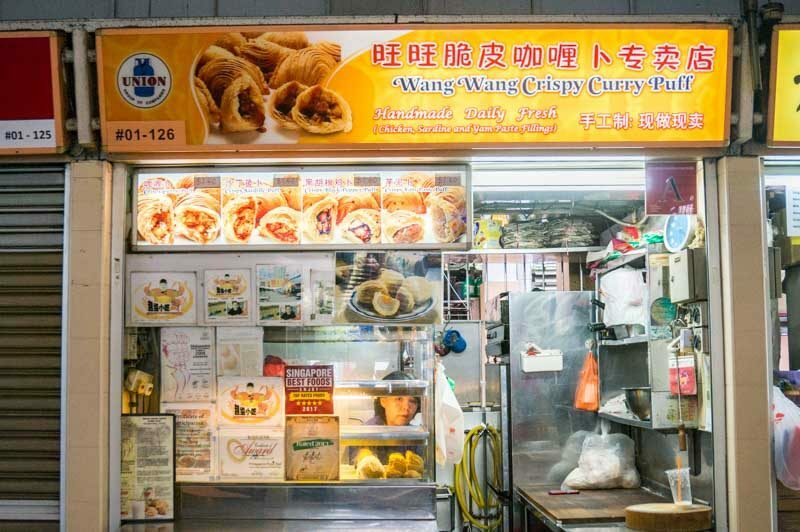 But at Wang Wang Crispy Curry Puff, these small baked puffs deliver the perfect balance of flavours and textures, with a creamy filling and crispy pastry skin. 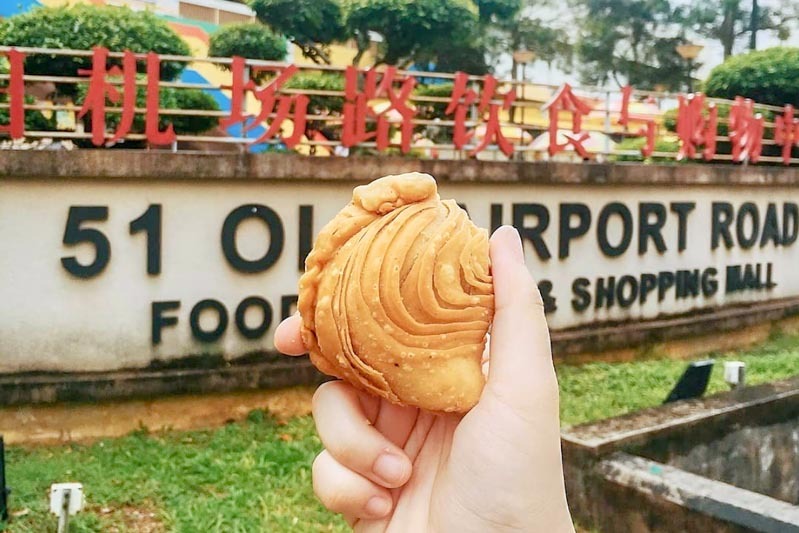 Freshly baked on site daily, the Crispy Curry Puff (S$1.40) wasn’t oily to the touch and had a beautiful golden-brown surface interlaced with layers. Not only was the pastry shell flaky and surprisingly light, the curry filling of diced chicken and potato chunks was also moist and savoury, sweet with a hint of spiciness. 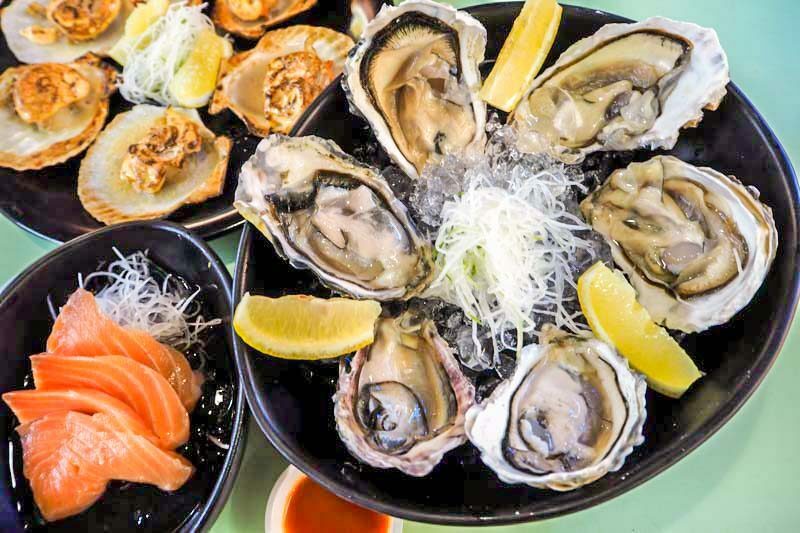 I’m sure you’ve seen bento sets like unagi or chicken teriyaki in the hawker scene, but at Unkai Japanese Cuisine you’ll find a menu offering cheap sashimi slices, hotate (scallops) and even oysters. You don’t have to worry about the freshness as the Premium Fresh Oysters (S$18, half a dozen) were shucked upon order in the stall. After seasoning with a squeeze of lemon and dashes of hot Tabasco sauce, slurp up the oysters to experience bursts of soft brininess. Who says you can’t treat yourself during lunch? 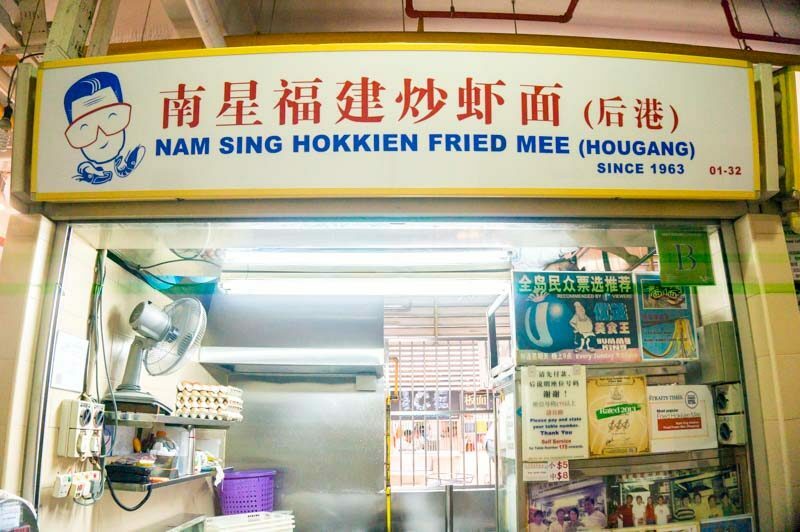 You can’t say you’ve been to Old Airport Road Food Centre without a visit to the famous Nam Sing Hokkien Fried Mee (Hougang) to try the hokkien mee fried with prawns, squid and eggs. 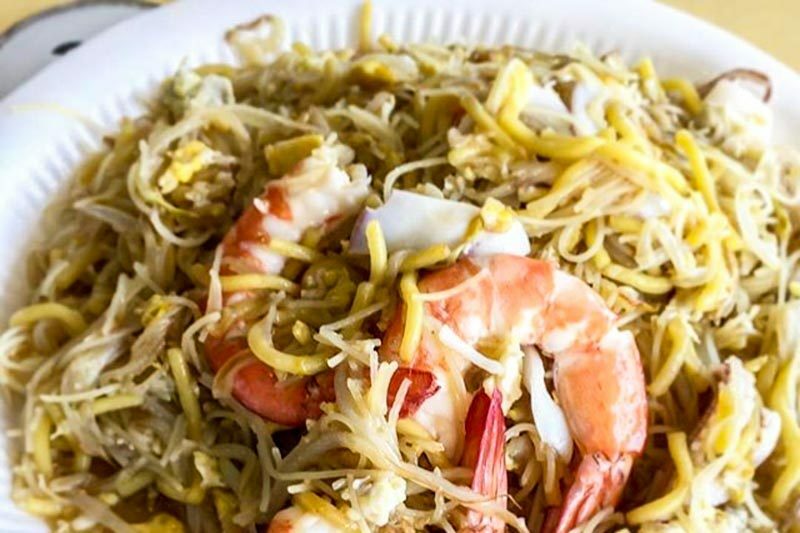 Be prepared to wait for 30 to 45 minutes to feast on the Hokkien Fried Mee (S$5) which comes piled with a mix of bee hoon and yellow noodles, fresh seafood and pieces of eggs soaked in a seafood stock. It’s a hit because of the subtle smokiness of the wok and savoury seafood flavours slathered on the al dente noodles. 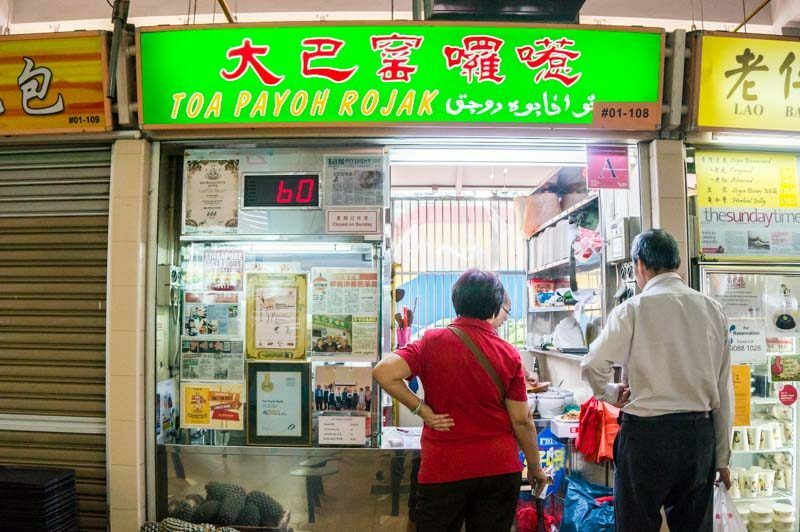 Toa Payoh Rojak is one of the rare hawker stalls with a system of queue numbers to make sure hungry customers get their share of the sweet and spicy rojak with flexible customisation of certain ingredients and level of spiciness. I’ve had my fair share of this dish from Old Airport Road and I have to give their version of Rojak (S$4) a thumbs-up — it was an eclectic and delicious mixture of fresh bean sprouts, spinach, tau pok and youtiao speckled with crushed peanuts, all smothered in the sweet and tangy shrimp paste dressing. J. & J. 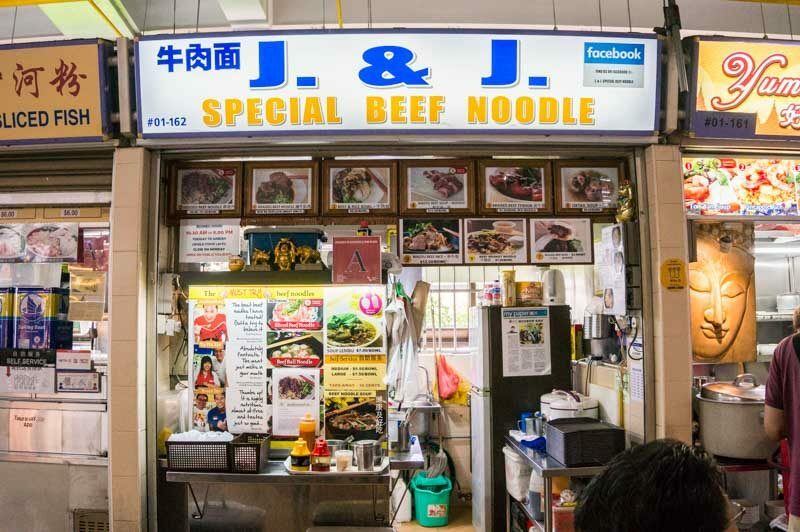 Special Beef Noodle serves up beef noodles with high-quality beef at an affordable price, and the melt-in-your-mouth servings of braised beef slices and tendon were really drool-worthy. Plus they even serve wagyu beef with noodles or rice as well! Yes, WAGYU. 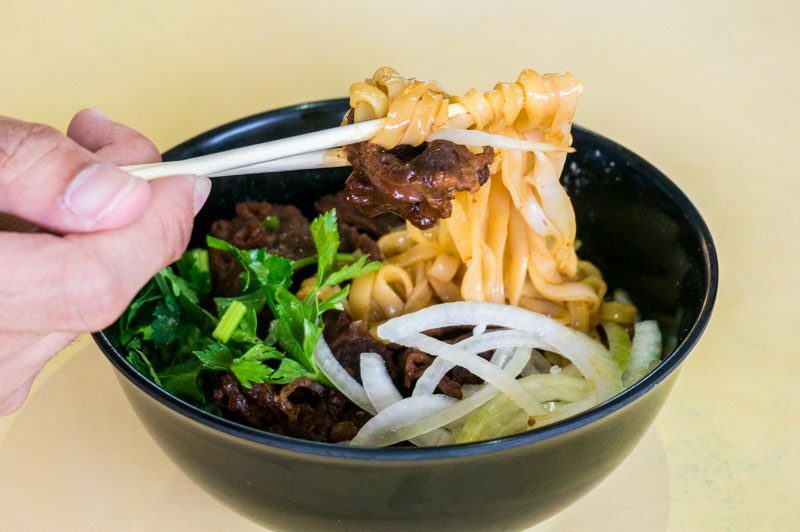 The Braised Beef Noodle (S$5.50 regular, S$7.50 large) featured flat noodles lightly soaked in the savoury sauce, braised beef chunks and a side of fresh onion slices. The well-marinated beef was indeed tender and creamy with collagen and the slices of onion gave a nice kick to the overall dish. Definitely a special experience at Old Airport Road food centre. 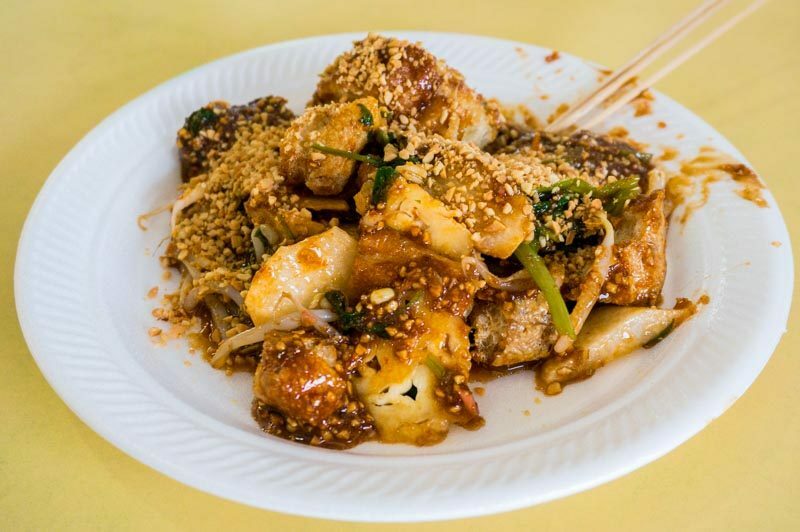 Freshly Made Chee Cheong Fun has repetitively been hailed by numerous reviews and it makes you wonder whether these rice noodle rolls with varied fillings like char siew, century egg, otah and prawns are really all they’re cracked up to be. Filled with pieces of smoky char siew, the Char Siew (S$2) had a thin and smooth skin garnished with fried shallots and spring onions. 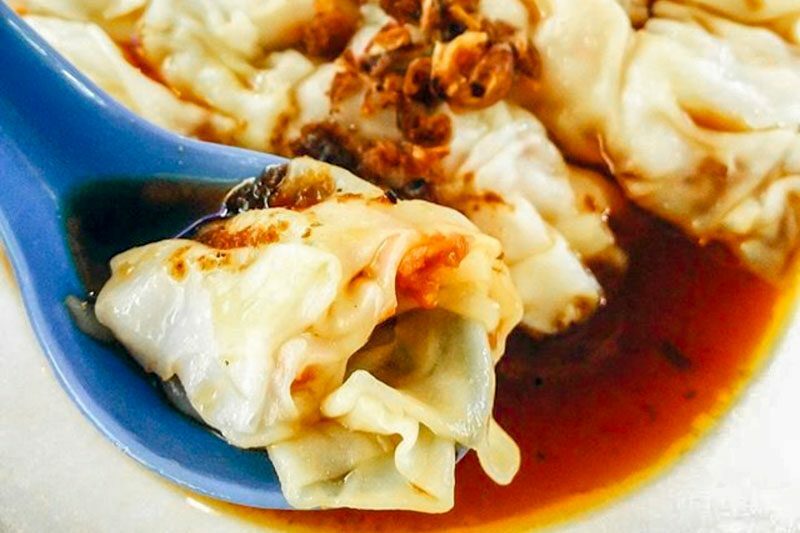 The chee cheong fun soaked up the light soy sauce and chilli with bits of dried shrimp to ensure every mouthful of the rolls was full of strong, well-rounded flavours, enticing you to finish the plate in a matter of seconds. Worth the hype! The endless debate over Whitely Road Big Prawn Noodle versus Albert Street Prawn Noodles hasn’t and probably will never reach a conclusion as everyone holds differing opinions of the dish. When I was there, I randomly decided to give Albert Street prawn noodles a try. 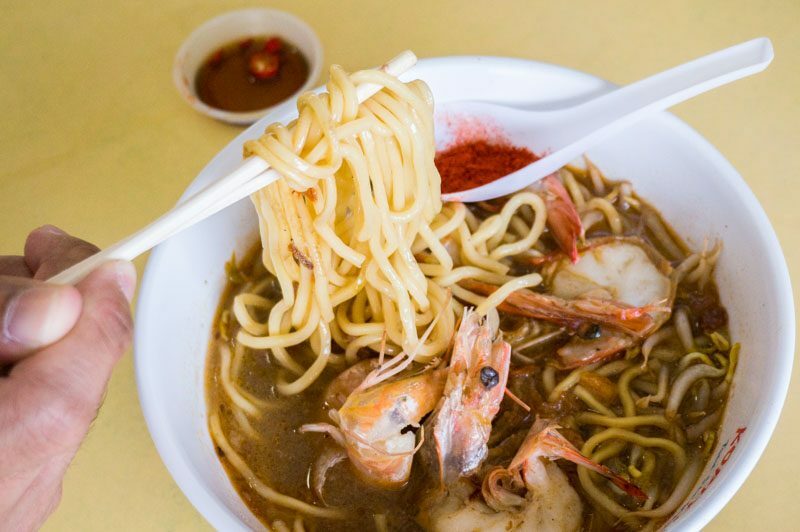 The bowl of Prawn Noodle (S$5.50 regular, S$8.50 large) brimmed with round noodles immersed in a semi-dark broth, with bean sprouts and prawns atop. I really liked the ample portion as well as the nice balance of flavours in the soup, which thankfully wasn’t very oily. I can’t tell yet if it beats its competitor in my books, but it sure made me want to come back for more. 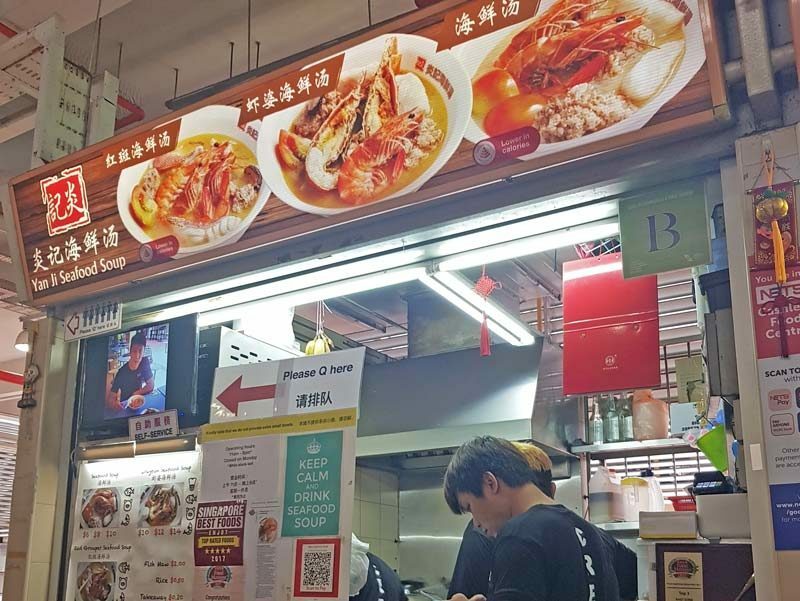 Yan Ji Seafood Soup is the dark horse of Old Airport Road Food Centre. I tried the S$12 bowl which comes with two small crayfish, two prawns, minced meat and dory fish. The soup broth boiled with the seafood was extremely rich with depth and was absolutely delicious. The minced meat is also worth a special mention, which comes marinated with hua diao wine and has salted fish mixed in the paste. Unfortunately topping up soup afterwards means a more diluted version of the broth, so savour what you have in the little bowl that was boiled with all the seafood. 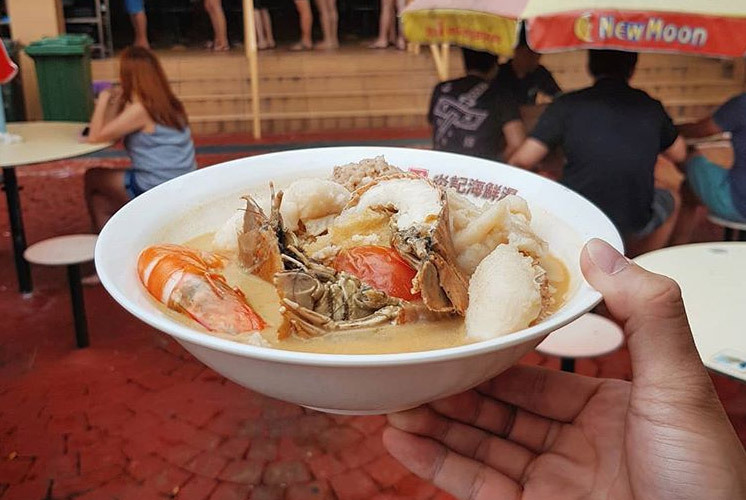 This stall truly serves up very underrated seafood soup without much of a queue compared to the other more popular hawkers, and is probably the food centre’s best kept secret (up till this point anyway)!